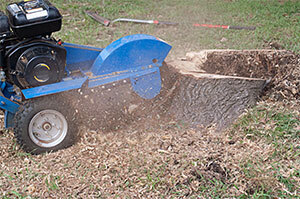 Stump grinding is the most common method of removing an unwanted stump and surface roots on your property. Donovan Arborists grinds to a depth of 8-10 inches below ground level. This process produces a wood chip and soil mixture that is great to use as compost. If you do not want the compost, we can rake the area level and haul away the excess debris. If you are planning on planting another tree or turf in the same area, we recommend having us clean the stump hole of the wood chip and soil mixture and backfilling with top soil. New plants have a difficult time getting established in the compost mixture.